In April 2017, we adjusted the artillery settings as part of Update 0.9.18. Since then, World of Tanks has changed significantly but SPGs as a class have remained largely untouched. We've added new branches of vehicles and new nations and reworked elements of the matchmaker. Now we’re finally ready to take the next step and make some adjustments to this unique class. But first, let's look at how artillery has evolved in recent years. Changes we made have had different effects on all SPGs, but in general, the number of penetrations decreased significantly. During the rebalancing process, we significantly reduced the nominal damage of HE shells and decreased the average damage caused by arty, both during the battle and with a single shot. Long stun time when under fire from several SPGs. Currently, every new stun works independently from the previous one. As a result, players who find themselves under fire from several SPGs can get a massive extension of the stun effect, which is not limited in any way. Such a situation is especially inconvenient for heavies and other slow machines: due to the constant stuns, they are forced to stand still with reduced characteristics and remain inactive. As a result, these machines become an easy target for adversaries. Our adjustments will consist of several large blocks. 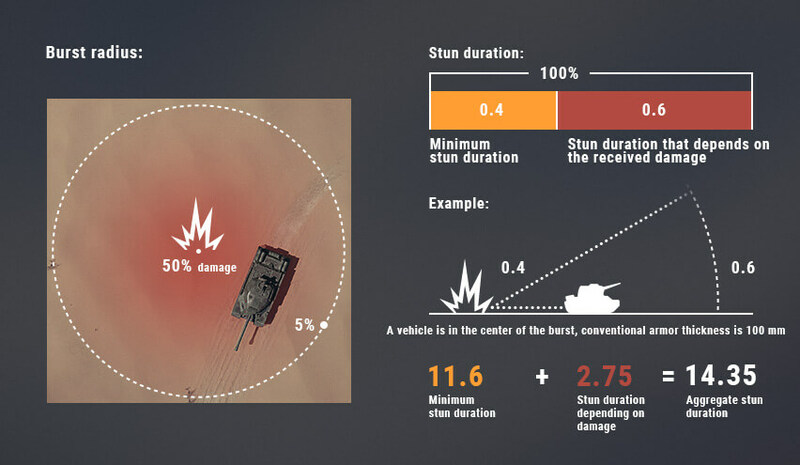 First, we're planning to reduce the duration of the stun from all artillery hits on already stunned vehicles. But let’s quickly take a look at a bit of theory, it will help you better understand the mechanics of the upcoming changes. The first component is constant for each SPG shell and doesn't depend on the damage inflicted. In the shell settings, this value is set by a coefficient from 0 to 1, and in your Garage, it's displayed as "minimum stun time" in seconds. This is one of the balance parameters of the shell - the same, for example, as penetration or velocity. This parameter is configured individually for each SPG shell, which has the ability to cause stun. 1. We will modify the constant component of the stun, which doesn't depend on the damage. Accordingly, we'll increase the influence of the variable component by 5%. Using the example of the Object 261, this ratio will change from 0.45 and 0.55 to 0.4 and 0.6. 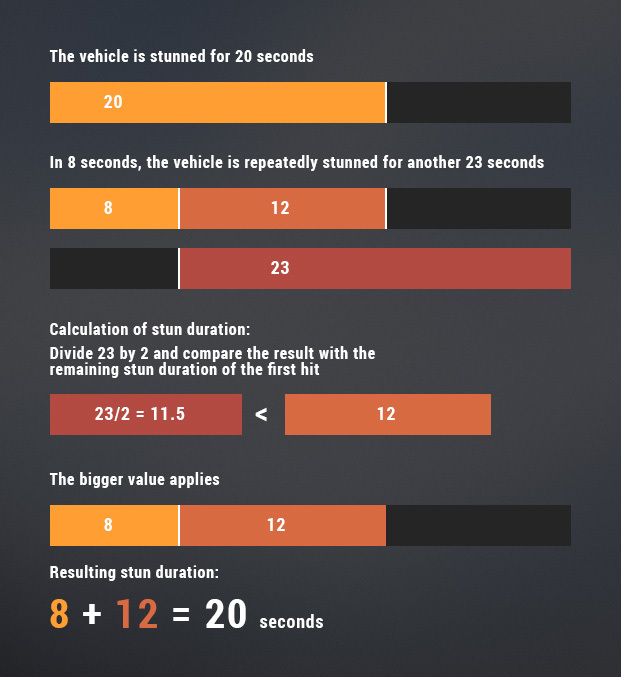 This will change the minimum stun time for the Object 261 from 13.05 to 11.67 seconds. 2. We will also modify the second component of the stun, which depends on the damage. We will change the distribution of damage from the splash depending on the distance from the tank to the center of the explosion. Now this range is from 0.5 in the center of the splash to 0.15 on the edge. We will reduce the amount of damage at the edge of the splash from 0.15 to 0.05. This will decrease all splash damage, except for cases when a high-explosive shell explodes directly on the armour. And this, in turn, will lead to a slight decrease in the second component of the stun. 4. We will reduce the stun time when an SPG shell hits a vehicle which is already under the effect of stun if the machine is equipped with a Spall Liner. Now the Superheavy Spall Liner will reduce the additional stun time by an additional 20%, and a Heavy Spall Liner by 10%. For example, if the additional stun time is 15 seconds, when using Superheavy Spall Liner it will be reduced to 12 seconds, and in the case of Heavy Spall Liner to 13.5 seconds. The first stun is 20 seconds. After 8 seconds, another shell hits your vehicle, adding another 23 seconds. 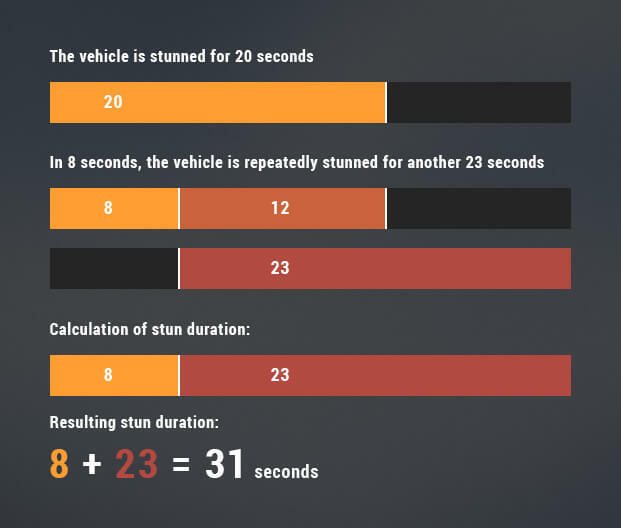 It is then halved, so the total stun time is 8 + 12 = 20 seconds.